From the moment you leave the hospital with your precious new cargo, you’ll want to be prepared to transport your baby safely–no matter where you go. That’s why, before baby arrives, you’ll need to do some homework and carefully choose an appropriate car seat. 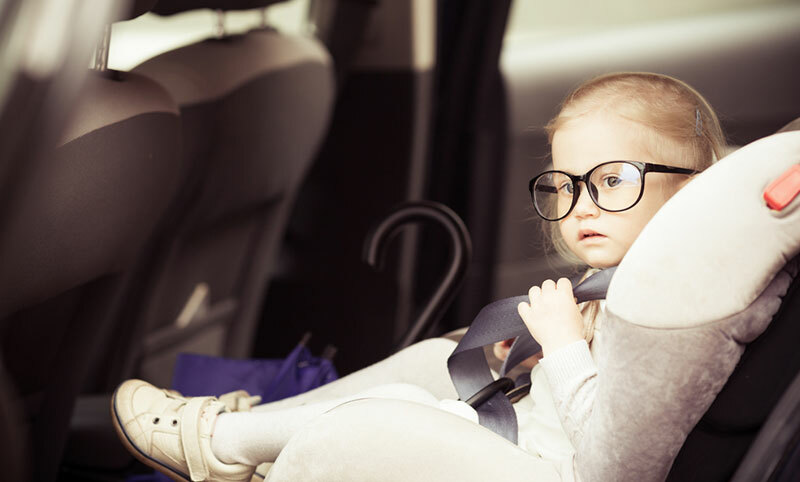 It’s not only for baby’s safety and your peace of mind; laws in all 50 states require car seats. But knowing that a car seat is necessary is the easy part. Choosing the right car seat is where it gets tricky. The process is almost like buying a car. There are scads of body types, upholstery styles, safety features, and prices. So fasten your seatbelts, parents. Here’s Car Seats 101. Choose a seat that you find easy to use and that fits in your vehicle. Be sure it can be buckled tightly. Look for the seat you can use facing rear as long as possible. Keep in mind that if you buy an infant-only seat, you will need an infant-toddler (convertible) seat later. There are as many opinions about the safest, most comfortable, and most convenient car seats as there are car seats. But there is only one absolute to follow in the process. 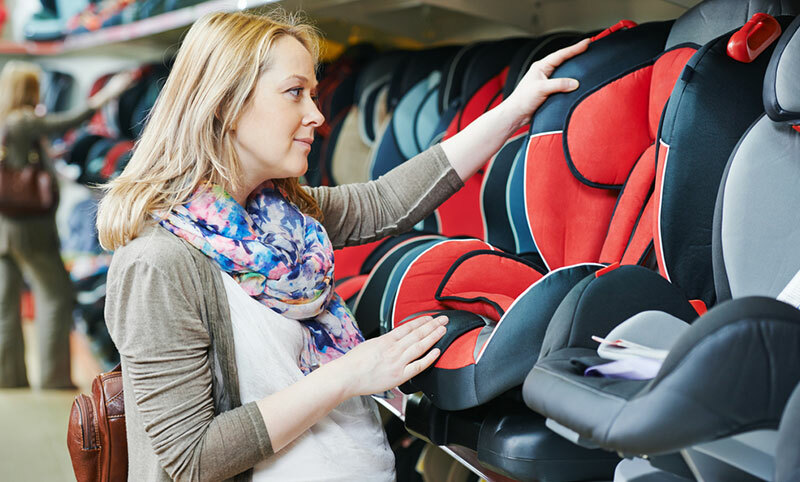 A baby car seat must pass Federal Motor Vehicle Safety Standards. Make sure when you’re scouting around that the product you choose has passed muster. Infant car seats are designed specifically for infants up to 22 pounds or 26 inches long. 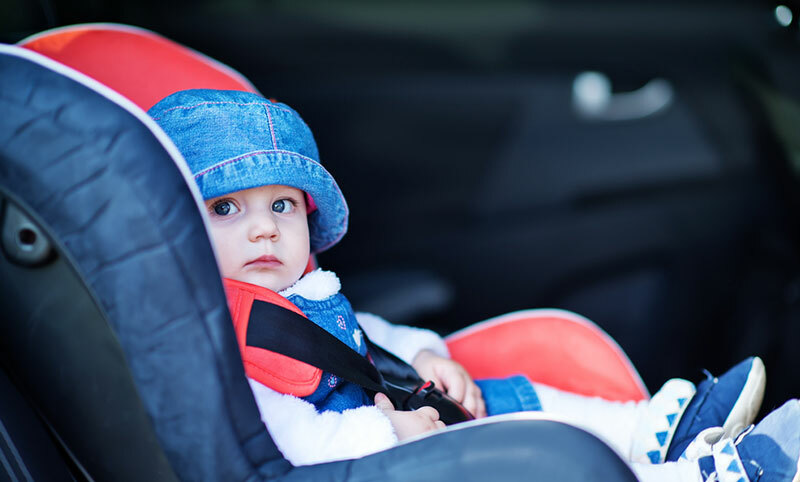 Although there are many brands and features to choose from, all infant car seats have one thing in common: they are designed to support a developing infant’s back, neck, and head. Infant car seats should be installed rear-facing (facing the back window of your vehicle) in the center of your back seat. For added convenience and comfort for baby, many models are available with a stay-in-car base that not only allows you quick installation, but easy and gentle removal from the car without waking your sleeping baby (a feature parents love). Three-Point Harness – A three-point harness secures your child at the shoulders and between the legs. Five-Point Harness – A five-point harness secures your child at the shoulders, hips, and between the legs. Designed for newborns up to approximately 20 pounds, then converts to a car seat for infants 20 to 40 pounds. Convertible car seats are so named because they can be converted from a rear-facing infant seat to a forward-facing seat. This means that from birth to around the time she reaches her first birthday, your baby can keep the same car seat. An added bonus is that she gets to face the front of the car like everyone else. Five-Point Harness – Consists of five straps–two at the shoulders, two at the hips, and one at the crotch. This allows parents to adjust the harness closer to baby’s body and is easy to buckle and unbuckle. This is the best choice if you’re using the seat for a small baby and provides the best protection against head injury. Three-Point Harness with T-Shield – This model uses a soft, T-shaped center section to draw the shoulder straps over your child. The “T” then buckles into the seat shell at the crotch. It’s simple to use and easy to position. It is not appropriate for an infant whose head does not clear the T-shield. The shield harness should be no more than chest high when fastened. Three-Point Harness with Overhead Shield – This padded T-shaped or triangular shield swings down over baby’s head, drawing the straps over the shoulders. A third strap buckles the shield to the seat at the crotch. Some are adjustable and can be tightened to accommodate smaller children or loosened for bulky clothing. This restraint system fits properly when the shield is at the child’s chest level. When your child has outgrown the convertible seat, but is too small to use your car’s safety belt system alone, it’s time to move to a booster seat. Designed specifically to help standard vehicle seat belts fit children better, these specialized seats are appropriate for children who are 4 to 8 years old, weigh between 40 and 80 pounds, and who are less than 4-feet-9-inches tall. By reducing the potential for belt-induced injury which can occur when a lap or lap/shoulder belt is a small child’s only restraint, booster seats play a very important role in protecting children as they transition from a child safety seat to an adult-sized lap and shoulder belt. Belt-Positioning Booster – Designed for children who weigh between 40 and 80 pounds, belt-positioning boosters are available in high-backed and backless models. The child sits in the booster seat and uses the vehicle lap and shoulder belts for restraint. Lap and shoulder belts together offer better protection than lap belts only. High-Backed Booster with 5-Point Harness – This type of booster seat can be used as a forward-facing child safety seat for a child who weighs between 20 and 40 pounds, or more. The booster seat is attached to vehicle with either the LATCH system’s lower anchorages or the vehicle’s belt system and tether (if the seat has one), while a 5-point harness provides full body protection. When a child reaches 40 pounds, the 5-point harness is removed and the seat converts to a belt-positioning booster seat. In this configuration the child uses the vehicle’s lap and shoulder belts for restraint, and a tether will not be used. These extra-small bundles of joy need extra attention while on the road. Here are some helpful suggestions when considering a seat for your preemie. Use a seat with the shortest distances from seat to harness strap slots, and from back to crotch strap. Supplement baby’s comfort and safety by rolling blankets or towels and placing them on either side of baby to keep his head from slumping. Never place any extra cushioning under or behind the baby. Use the lowest harness slots for a newborn infant. Keep the straps in the slots at or below your baby’s shoulders for the rear-facing position. It’s important for an infant to ride sitting semireclined, about halfway back or 45 degrees from horizontal. Make sure harness straps fit properly over the shoulders and between the legs of your infant. To fill empty spaces and give support, roll up a couple of small blankets and tuck them in on each side of your baby’s shoulders and head. Never use any car seat or booster car seat in a seat with an air bag. Be sure that the car seat you purchase is appropriate for your child’s height and weight. Send in the manufacturer’s registration card. If by any chance your car seat is recalled, you will be notified by the manufacturer. The base of your car seat should rest firmly on the seat, and the vehicle’s belt must be able to secure it tightly. If it moves an inch in any direction, it’s too loose. If your car has lap and shoulder belts with a free-sliding latch, you must use the locking clip included with most car seats. (Locking clips are also sold separately.) Follow manufacturer’s instructions for installation. If you have any questions, contact the manufacturer. Also, many local police stations, fire stations, and hospitals can offer you assistance. 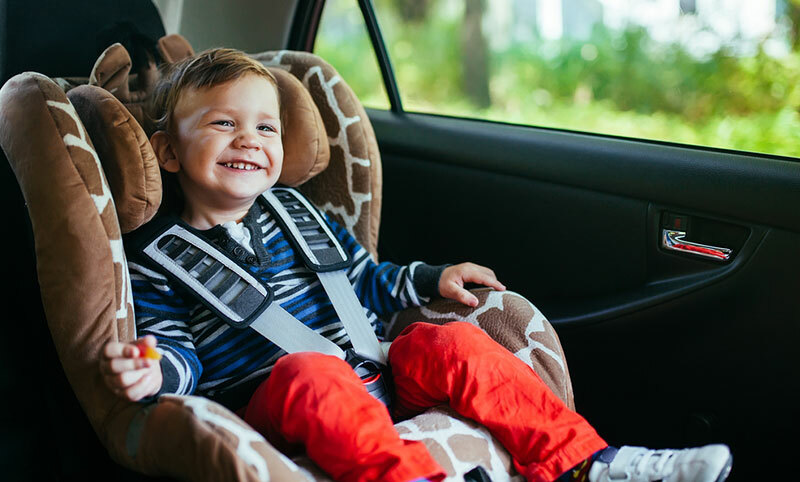 To make sure you have installed your car seat correctly, attend a car seat safety check and read our installation tips from the NHTSA. Many local fire departments, police stations, healthcare facilities, and even some local baby stores like Babies “R” Us will periodically hold these meetings and will examine your car seat installation at no charge. Avoid used car seats. Normal wear and involvement in accidents may limit their effectiveness. Also, they may not conform to present safety standards. Look for car seats featuring easy-release latches and buckles – When your hands are full, an easy release can save aggravation. Make sure there’s wiggle room – You want your baby to be comfortable year-round, so allow room in the seat for bundling up during cold weather. Make sure the product description indicates the seat accommodates larger youngsters than yours.